The McLaren Vale Motel is located opposite the McLaren Vale and Fleurieu Visitor Centre. Located nearby are 7 restaurants, 4 cellar doors sales within approximately 900 metres, local beaches plus the property is only 39km to Adelaide and 1 hour to Kangaroo Island Ferry terminal. 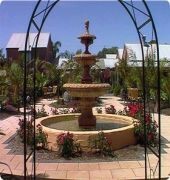 With 37 spacious ground floor units and apartments (44 rooms) the property is one of the largest accommodation providers in McLaren Vale Region. 12 new Studio Deluxe and Deluxe King 2 Bedroom apartments offer contemporary styling which complement the existing units.